SAN DIEGO—Court filings in California decreased by 9% in fiscal year 2014-15, a decline of more than 660,000 cases from the previous fiscal year. Approximately 90% of the decline occurred in matters that tend to be less complex, such as infractions, small claims, and civil cases in which the amount in dispute is $25,000 or less. 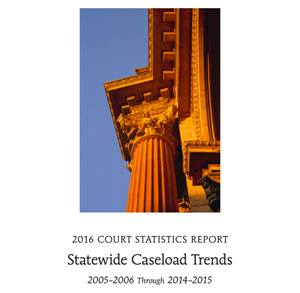 The findings are part of the 2016 Court Statistics Report, presented earlier today at the Judicial Council’s public business meeting in San Diego, and now posted on the California Courts public website. In addition to the one-year difference, court filings in California have declined 26% over the last 10 years. Today's presentation to the council cited a similar, but less dramatic decline in filings nationwide and several factors potentially affecting the decrease in California, including effects of the recession that reduced law enforcement and led to court closures. In addition to the report on court filings, the council today received the 2016 update of the Judicial Needs Assessment. While judgeship need has decreased per the decrease in court filings, the assessment shows that nearly 189 new judicial officers are still needed in 31 courts to meet the workload-based need for judgeships. Published annually by the council, the Court Statistics Report contains fiscal-year and 10-year trend data on the California Supreme Court, the Courts of Appeal, and the superior courts in the state’s 58 counties. Comprehensive county-level data are published in the online version of the report, along with a summary of the major filings trends.